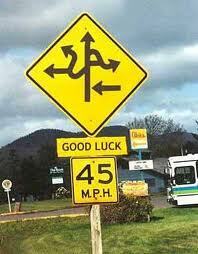 Decisions, decisions, decisions…life is full of fun, interesting, difficult, painful, and exciting decisions. This weekend, on a simple trail like the one above, it was illustrated for me how impactful a seemingly insignificant decision can be. Our family was walking along the Price Lake Trail along the Blue Ridge Parkway, enjoying a beautiful fall day. My 9 year old son was leading the way and we came to a fork in the trail. You couldn’t really see the end to either side, but there didn’t seem to be room for a true ‘fork’ so he said “you go that way and I’ll go this way daddy and we’ll meet up on the other side.” And that is what we did – we both walked maybe 20 yards and then the two trails came back together and we walked on. Maybe a half a mile later, we came to another fork and Jack again said, “let’s go both ways again and meet up.” Only this time the trails didn’t come back together. As soon as it went out of view, my trail veered off sharply, seemingly going somewhere else. As my son blissfully continued on the main path, it was clear to me that my path was not going to loop back around and reconnect. Because I’ve made roughly 792,149 more decisions in my life than my son, my experience told me that I’d better stop and turn around, return to the main trail, and catch up with my family before either I got lost or they got worried. Our decisions in life are often the same. Some of them we think are going to be so impactful and we worry over them, pray over them, and over think them. Then we get a few steps into the decision and realize it brings us back to the path we were on and we move comfortably along. Other times, in a moment of comfort or on a whim, we make what seems to be an insignificant decision and move down a path that ends up taking us in a completely different direction. 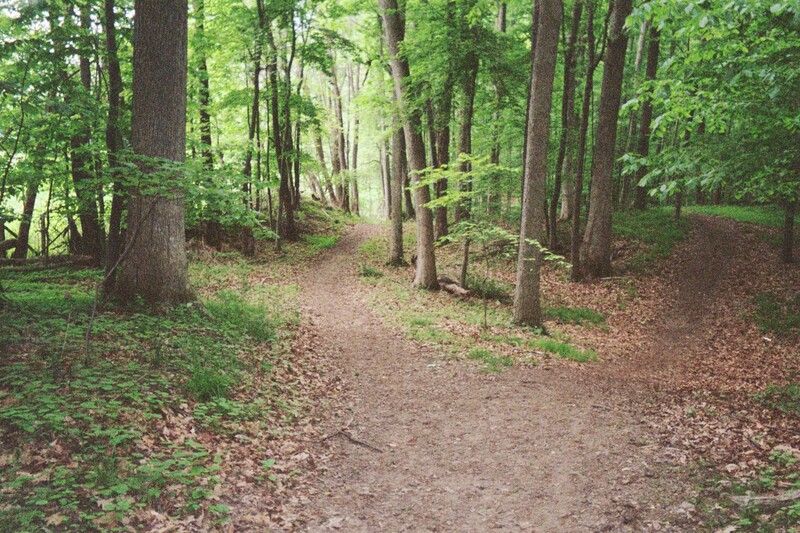 Sometimes we have the opportunity to backtrack to the main trail, but other times we end up just going a different direction and by the time we realize it, it has become our new path. I’ve made a lot of decisions in my life, well over a million I’d surmise. Some of them have been good and beneficial and others have been painful and hard. But every one of them has made me who I am. As I continue forward on my life’s path, I think I’ll keep in mind that each decision, large and small, is impactful to who I am becoming. Being mindful of this won’t avoid hurt, pain, and sorrow, to be sure. Being mindful of my decisions will, however, make me more self-aware of what it is that makes me the person I am and the person I will become. It seems that about every two years I find myself really restless. I can’t put my finger on what causes it, but I can usually sense it coming on. And then the restlessness comes to head and I feel like I’m standing in front of the sign above trying to make a decision about what to do, but no matter what I do I can’t settle on a path. When I’m in this restless state I find it hard to practice any sort of quiet meditation and my mind races in 10 different directions any time I try to focus. I’ll turn my attention to work, but stare at my daily planner and think how benign every single thing I need to do this week looks. I’ll get out of the house and try to change the scenery and just waste time in a fruitless effort to try to get my focus turned to something. I’ll get 3 or 4 different books going at once because none of them can seem to keep my attention. I’ll drag my family around looking at houses or bore my wife with stories about exotic ideas of living somewhere else. I’ll sit down to write and it will come up stream of consciousness (just like this) and feel disconnected. It can be maddening. Apparently this is a thing, because if you google restless life syndrome, you get a lot of results. However, does knowing that I’m not the only one that suffers from this make it better? Nope. In the past when this has happened, it has often lead to a spiral of restlessness in my life that causes me to chase change for change’s sake. If I look back on the most severe cases of this strange phenomenon that I’ve experienced, they led to me moving to Colorado, getting out of coaching, taking a job that just about crushed my marriage because of all of the travel, starting a small business, and uprooting my family without hardly consulting my wife or giving any concern to how she might feel about it. Not all of those turned out bad, but to some degree they all caused pain that was tough to fight through. I’m thinking that this time I’m going to behave differently. We’ve got a great house (with 2 brand new air conditioners), a great life (with a new used car that’s super cool), two great kids, two great jobs, and not much to complain about. It would be pretty stupid to blow all of that up just because I’m feeling a little restless. Instead, I’m going to soldier through. It will be uncomfortable and unnatural for me. I like change. But I think it is an important discipline for me to learn to stick. I fully expect that my mind will continue to wander, my focus will be challenged, and my work for a time will be uninspired. I am hopeful that on the other side of this bout with restlessness I am going to find a peace that I’ve not experienced before because I’ve always given in to the urge to make a big change. I’m sort of excited to see what that peace is all about. That seems like a much healthier thing to be restless about. About a year and a half ago, on a business trip to San Francisco, I decided that I ought to start writing down my thoughts and publishing them on this blog. Originally, it was just a way to formalize something that a few acquaintances and I had been doing on Facebook – documenting the cool places we got to run when we traveled for work. For me, it has progressed quite a bit from that. 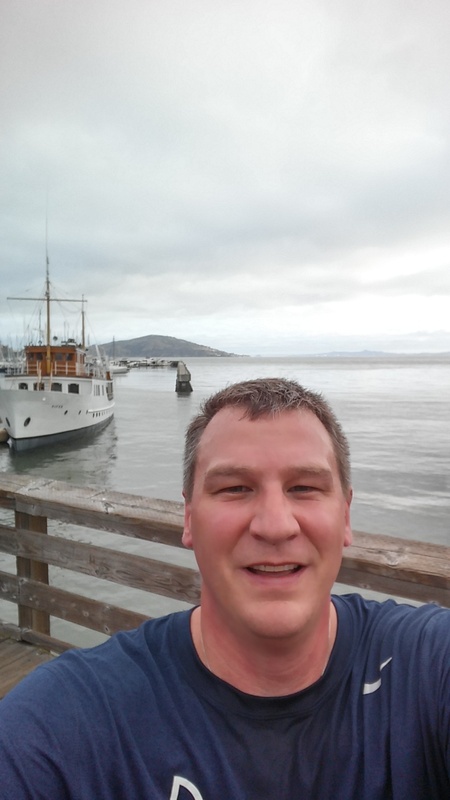 This week, I was back in San Francisco for business and went for a morning run again down on Embarcadero Avenue that runs down along the waterfront. This was the place that I ran the first morning before that first blog post, and I saw a lot of the same sights. I thought it was the appropriate time to revisit some of the beginnings of these ramblings and remind myself of the state of mind and areas of focus I was dealing with back then. The thing that struck me the most about reading those entries I wrote when I first decided that it was important to share my thoughts was how my beliefs haven’t shifted much, but how I have drifted from the focus I seemed to have back then on those beliefs. Specifically, I still feel very strongly about the importance of stillness, being quiet, being present in the moment, and being mindful at all times. However, reading my own writing from the fall of 2013, I can see that at the time, living that out daily and reminding myself daily to be focused on those things was key to my emotional and mental well being and a priority in my life. During the past 18 months I have allowed those things to be less central in my day to day routine. I could wax on and on about how much more complicated life is since those beginning posts – I’m approaching 40 years old, I’m 2 years into a career instead of 6 months and have a lot more professional responsibilities because of that, my children are getting more and more busy and time consuming all of the time, my relationship with my wife has grown over the past year and a half which leads us to more and deeper conversations and connections, and I’m no longer training for a marathon and having hours on end of solitude while I run. These, however, would all be excuses. The truth of the matter is that, as is so often true with all of life, our priorities, and the things we focus on, go through cycles. Various factors influence these cycles, but in the end it is natural for us to realize ebbs and flows in our life when it comes to emotional, relational, spiritual, physical, and mental well being. We shouldn’t beat ourselves up about not being where we were a year ago or 5 years ago in any of those areas. We should, however, return to beginnings occasionally and see if there are things of value from those beginnings that we can try to bring back in to our lives that will benefit the here and now. For me personally, returning once again to San Francisco, running that same route along the Bay, and re-reading what I wrote when I started morningrunguys reminds me that although a lot of circumstances of life have changed in that short period of time, I still need to MAKE TIME to be still and quiet on a regular basis and I need to be more disciplined about not only taking regular morning runs, but also allowing time to reflect on the things that go through my mind on those runs. As I read back through some of my old posts, it is clear to me that when I allowed for this time and reflection, it had a positive impact on my personal and relational life. I don’t know what the rest of 2015 will hold, or where I’ll be mentally or emotionally when the 2 year anniversary of these musings rolls around. But I am going to commit to returning to the deeper reflection of the beginnings of this blog, because when I return to the beginning I can see that they had an impact on how I expressed myself and I want that depth back to my soul.